At a time when companies are looking to everybody and anybody for ways to become more energy efficient, finding the right product(s) for your facility can often be a major headache. Unless, of course, you have a company like APS Resource on your speed dial. Open gaps where light is creeping through? No problem. Air escaping from around your dock leveler due to mass airflow? We’ve seen that before. Rising costs on your energy bills? We can do something about that. 50% of warehouse energy use is natural gas consumption. Of that natural gas usage, 88% is delegated to space heating. 48% of warehouse energy use is electrical consumption. Of that electrical usage, 56% of that figure is being used for lighting and cooling. A typical cold storage facility sees approximately 54% of its energy funds being allocated to refrigeration. In the U.S. alone, warehouses spend on average $0.70 per square foot on energy. After considering these figures, have you taken the proper precautions in making sure you’re facility is “energy-efficient”? APS Resource has inspected numerous facilities and written strategic product implementation plans for them all. Instead of burning a hole in your company’s proverbial pocket trying to stay on top of your energy costs, consider implementing energy-efficient solutions from APS Resource in your facility. We have listed five products that we believe can take your facility from energy zero to energy hero. First up is our Door Weatherseal, which is built with dense polypropylene bristle brush, tightly woven and crimped to ensure bristle density. Door Weatherseals can fit your standard 8’, 9’ and 10’ overhead doors, as well as any custom door you may need to be fitted. You can also select from various sizes including 1.5”, 2” and 3” bristle lengths. If you’re looking for a cost efficient quick fix, consider adding a Door Weatherseal. The Edge Sealr™ product is primarily placed at the bottom of your dock door to prevent energy from escaping your facility. Constructed of 22 oz. vinyl, Edge Sealr has the option of coming with or without flaps. The product’s standard length of coverage is 12’, but custom lengths are available. Pair this product with our supplemental Door Sprag™ and your dock area will be equipped with some impressive sealing qualities. 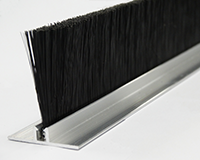 WeatherWall is a unique style of brush seal that pairs formidable propylene bristles with a layer of EDPM rubber lining the inside of the brush. The defining quality of WeatherWall is its versatility as it can be installed on all sides of doors, docks, conveyors, etc. Not only does this product keep outside elements from entering your facility, it’s also an excellent deterrent of vermin and insects. Let’s shift gears from sealing solutions and turn our attention to employee comfort. The Turbo-ES Fan produces a concentrated stream that forces hot, cold or stale air out from inside the trailer and replaces it with fresh air. This American-made product, with its heavy-duty steel construction, has a 1275 CFM output making it one of the most energy-efficient fans on the market. And finally, we present Energy Guard®, one of the most popular go-to products in our line of energy saving solutions. Perfect for levelers that can’t seem to stop cold air from exiting and hot air from entering your facility, Energy Guard eliminates the gaps around the sides and rear of the dock leveler while also sealing lifting holes. This superior perimeter seal effectively seals up to 9” above dock and is made of open cell foam encased in reinforced vinyl. Seeing positive results after implementation won’t take long either as the average ROI for Energy Guard is one year. Being conscious of your facility’s energy costs should be a top priority for your operations. At APS Resource, we’ll keep you ahead of the curve and energy-friendly with strategic solutions from our energy savings line-up. Please check us out on LinkedIn for more information about APS Resource. Feel free to contact us by phone (262-518-1000) or email (info@apsresource.com) us with any questions! Why not take the initiative today to ensure your facility sealed tight? … the right way with APS Resource.